Students that live on campus are given the opportunity to make friends and broaden their horizons. When you walk down the halls of our residence halls, you will meet people from all around the world. You will find that other students are studying the same subjects and will want to form study groups. You will find other students that are interested in similar activities you’re interested in, and friendships will form fast. It will not take long to make new friends that will last a lifetime. ● Students live in a community of diverse Mountaineers. 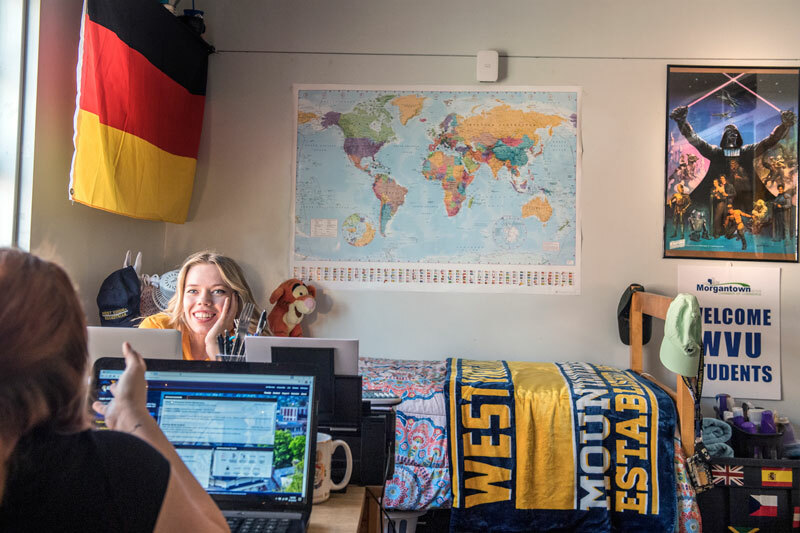 ● Students eat together in our residential dining options, coffee shops, quick service locations, restaurant options in the Evansdale Crossing and in our Mountainlair food. ● Students are always close to WVU activities from a wide range of departments. ● Students that live on campus are always conveniently close to our Student Recreation, or residential fitness rooms located in Boreman Hall, Dadisman Hall, Stalnaker Hall and Summit Hall. ● Students actively engage in social and developmental programs and activities put on by the hall councils and student leaders. Example of some programs and activities that have occurred in the past. © 2019 West Virginia University. WVU is an EEO/Affirmative Action employer — Minority/Female/Disability/Veteran. Last updated on February 3, 2017.